Riverside General Hospital, a place of harsh realities. On Ingram Ward, Staff Nurse John Hunter is a man on the edge. Unable to move on from the recent traumas in his life, pushed to the limit, and liking his job less and less, he makes a drugs error, and questions why he even wants to be a nurse. The incident puts him on a collision course with the hospital’s new matron. John’s best friend, Australian coronary care nurse, Dave Chiltern, discovers that helping a friend run his pub while he’s unwell can be more rewarding that his current job. Roxanne Jones, John’s girlfriend and a care assistant on Ingram Ward, is contacted by her former boyfriend, who tries to re-ignite old flames. Ingram Ward’s Sister, Sarah Ashe struggles to focus on her job after leaving her violent husband. Facing the impossible expectations of front- line NHS care, the nurses who struggle to save lives and preserve their own sanity as they do so, all face choices of their own. 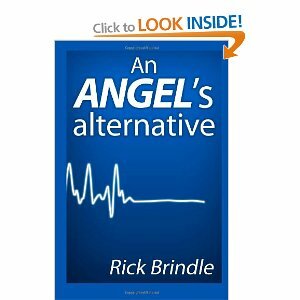 Do the angels have an alternative? This is a realistic no holes barred account of life for nurses in a busy hospital. It deals with themes such as work-stress, low morale of ward staff and hospital politics. The book follows the experience of 3 nurses John, Dave and Sarah. John is a staff nurse and Sarah is a Sister on Ingram Ward which is an acute medical ward and Dave is a staff nurse on Coronary Care Unit. As well as dealing with their sheer workload and reluctant patients like Tom, they deal with a power happy Matron trying to make her mark for the Trust and a dangerous squaddie. The limitations of the NHS are very accurately described as are the situations on the ward. You have to have been there to write like this! More enthralling than TV’s casualty and much more hair-raising I loved the characters in this book, and it was a very enjoyable read. I recommend it highly to anyone who loves or is looking to love medical dramas. Thanks for taking the time to review my work.